When it comes to comparing same games on different consoles, most of the time it simply feels like comparing apples to apples. Unfortunately, in the case of Ghostbusters, we're comparing apples on a tree to fallen apples that may have been hit by a lawnmower once or twice. Since it's important to know where your money is going, we felt it necessary to share the differences this time. Visually, the Playstation 3 has always claimed more impressive graphics over the Xbox 360 version of almost any multiplatform game. Sometimes the motion blur gets to be a little much in games like inFAMOUS, but we tend to appreciate the shiny screen anyway. Whether the PlayStation 3 actually has better graphics than the 360 is up in the air. 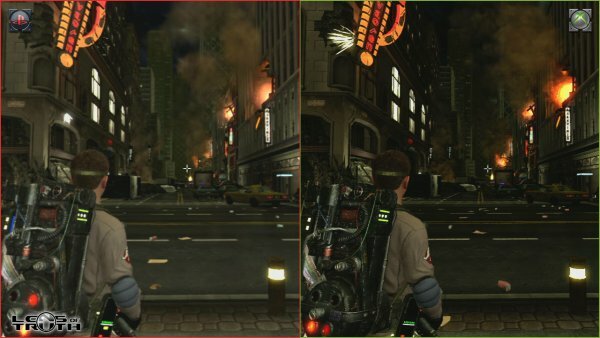 In the case of Ghostbusters on the PlayStation 3, the screen is unusually muddled for retail copy comparisons, which was discouraging to fans who held their breath for this one. 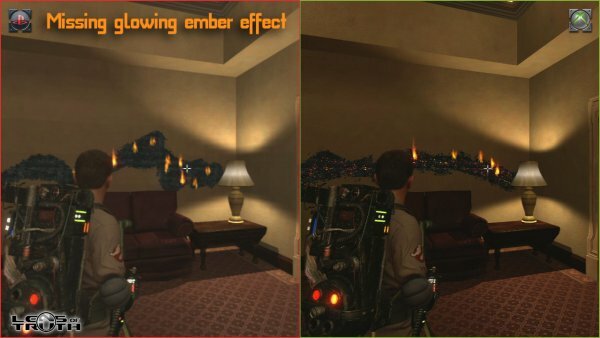 Texture quality is especially poor on the PS3 for Ghostbusters. LensofTruth.com had some Rollover screenshots to better illustrate what we mean. Otherwise, if you're undecided which direction to go, assuming you have both options available to you, you know what you're looking at this time. The good news for PS3 owners is both versions performed nearly the same. Aside from the massive mandatory install (almost 4 gigs at about 8 minutes!) on the PS3, which unfortunately didn't help the load times actually improve, the games were otherwise on even ground there. The control on both systems was also reported as being equally as smooth. So, the big issues with the PS3 version were visuals and that pesky mandatory install. Co-optimus heartily recommends the Xbox 360 version, for all your co-op needs.